Last winter was… rough around these parts. The temps were abnormally low. Cloud cover was the norm. Snow and ice lingered. School closings were so commonplace, the local kids had perhaps two weeks of normal attendance between December and March. Deprived of the sun, unable to feel productive, stalled in any professional endeavor that required travel, I came face-to-face with winter depression. The last time that happened, my son and I were living poor on a rural farm. Transportation was difficult in the best weather–astronomical gas prices combined with long distances severely limited trips to town–but became a fearful battle when snowstorms and ice swept in. Driving six miles through open fields, when the only indication of where the road might be are the widely-spaced mailboxes is… stressful. This year, I was determined to set positive things in place so the winter wouldn’t rip my heart out. Really, last year was horrible enough to frighten me into being much more proactive this time around. Working from inside the body, I stocked up on a high-quality D3 supplement. I take 4000 to 6000 IU of D3 every day. Every single day. I’d done that in previous winters, and just didn’t make it a priority last year because… I don’t know. Perhaps because I got complacent. But by the time I thought Vitamin D just might take the edge off my desire to curl up the closet until June, playing catch-up was hard. I’m not taking that risk this year. Outside, I put up additional bird feeders. A skilled birdwatcher I am not, and I have no desire to become one. But I discovered watching the birds brings me joy and calm. So I keep the feeders hanging around my front porch filled, and spend a my morning coffee-time watching the birds. Getting the no-waste feed makes this less of a clean-up hassle as well. Besides, Gambit-pup watches birds with feline-like interest, so he gets entertained as well. In the house, I changed out curtains–trading the light-blocking ones in my east-facing bedroom for white sailcloth that lets in all the dawn’s early light. I also put a floral window decal on the window’s lower half, which not only provides privacy, but keeps my neighbor’s silly floodlight from illuminating my bed. Thus I sleep with the curtains open and enjoy the first possible moments of rising sunlight. My back door also faces east, and since its window looks directly into the living room, I’d either kept it curtained or used a plain etched-glass window decal so I didn’t feel as if anyone could stand on the back deck and watch me sit on the couch. 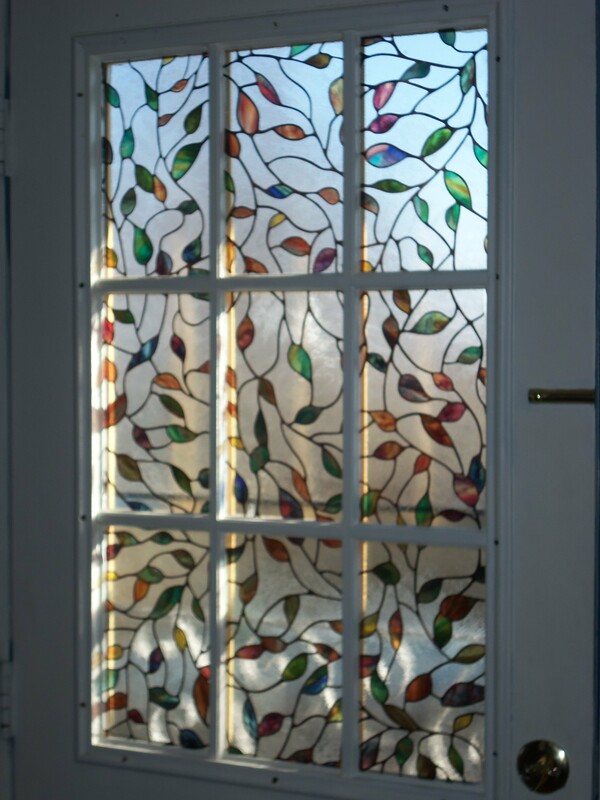 Seeing the morning light blocked out or whitewashed bummed me out, so I found another window decal that would splash color into the house every morning. I gotta say, I smile every day the sun comes through that window. And on top of all that, I’m counting down to spring. I remind myself we’ve already reached the middle of January, that the winter hasn’t been nearly as harsh as last year, that I have to make it through only two more months of true winter risk before things begin to improve. Tomorrow we’ll have temps around 40. 40! It’s a gift! I plan to go outside and lay weedblock stuff in the garden. Because gardens and outside and sunshine are all elements of hope and promise. Because winter won’t last forever. Previous PostStranger and Hostage — Reviews!Next PostThe Indie Fantasy Bundle Is Live!